4.Click on “Real name Authentication” to verify your account for withdrawal purposes. Click here for user-authentication guide. MBAex is Southeast-Asia’s biggest blockchain assets trading platform with a full-fledged forex brokerage system and standardized banking system. That entails us the capacity of implementing the concept of forex brokerage with blockchain assets trading; a powerful combination that would foresee a soar in transaction and trading volumes. We are also a cryptocurrency-exchange platform that fully complies with anti-money laundering laws and jurisdictions. Our experience in the development and utilization of blockchain technology enables us to roam beyond conventional financial trading activities, as MBAex is wholly dedicated in promoting the usage of prime blockchain assets that are safe and strong in investment value. 2. Serving and complementing the real economy with blockchain assets, to ensure stable growth in the blockchain industry. 3. Providing high-quality customer service with assertive, quick-respond times. 4. Ensuring that our services provided is backed by the most secured and robust technology available to provide a peace of mind to all customers. MBAex serves as a platform which enables people to conduct trading and invest in multi-blockchain assets around the world with their e-wallets. Introducing scalable infrastructure that expands the capabilities of blockchain technology, enabling mainstream blockchain adoption which will drive positive change in the digital assets space. MBAex’s platform implements highly secured encryption technology featuring SSL (https website), Cold Storage, 2-Step Verification on All Accounts, and Wallets (and private keys) are stored using AES-256 encryption. Our platform enables Customer to customer (C2C) trading, allowing to users to buy and sell cryptocurrency directly with merchants at their own leisure and preference. C2C trading also lets both buyers and sellers to enjoy zero transaction fee for using the platform and have a faster and safer trading experience. Extensive customer service and support, with significant presence in Southeast-Asian regions with multi-lingual support..
Banks may charge high fees for various services. MBAex enables users to obtain a suite of services at the lowest fees possible, as low as 0.1% available now. 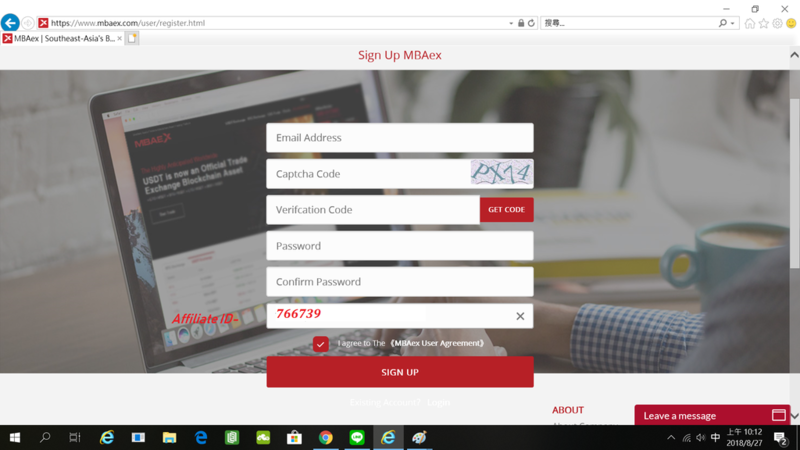 MBAex’s Introducing Broker (IB) program offers fair and profitable conditions to prospective partners that allow them to receive an income from clients they introduce to our Company, while enjoying lucrative returns through earning commissions that depends on the quality and quantity of clients they attract.